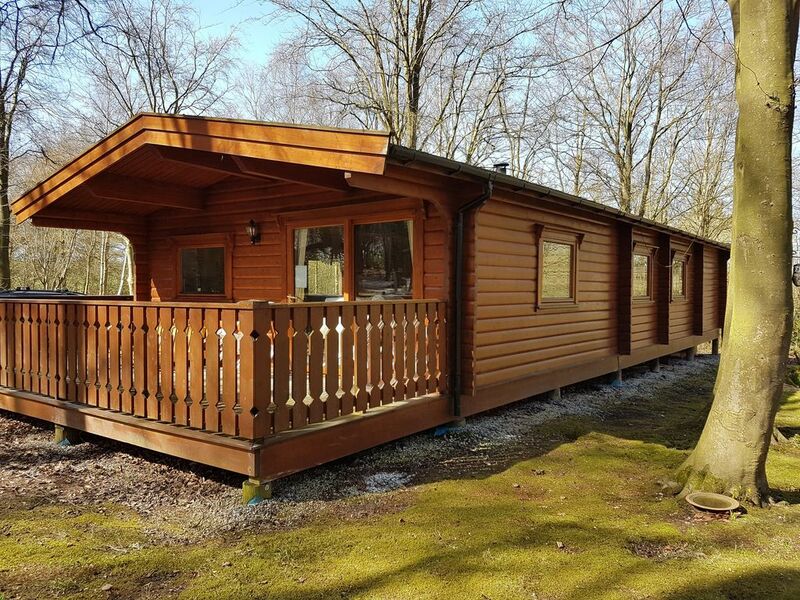 Poppy Lodge is set in Kenwick Park Woods, within the Lincolnshire Wolds (an Area of Outstanding Natural Beauty). The Lodge is 2.5 miles from the bustling Georgian market town of Louth, offering a great range of independent shops, cafes and restaurants. The Lodge is located within the woods of Kenwick Park hotel and golf course. There is a hotel restaurant, bar and a golf club house. Poppy Lodge is comprised of a spacious living, kitchen and dining area with access on to the veranda. Master bedroom with en-suite bathroom. Double bedroom. Twin bedroom. Separate shower room. Ample parking for three cars. I am a Primary School teacher. I have two children and we regularly enjoy holidays together in Poppy Lodge and our 'sister' property, Connie Cottage. A relaxing location within easy reach of all the amenities you may need. Louth has many independent shops, restaurants and tea rooms. A beautiful, historic church, weekly market, a cinema and really good leisure centre. toilet, combination tub/shower, The over bath shower is free standing-hands free if needed! About a 20 minute drive to the nearest beach. There are a wide range of beaches within half an hour drive. Some beaches are nature reserves whilst others cater for children with donkey rides etc. Located in the woods in rural Lincolnshire, only 2.5 miles from historic Louth. Great countryside all around for walking or cycling. 2.5 miles from the historic Georgian town of Louth with a cinema,many independent shops, weekly market and impressive church. Many pubs, restaurants and tea rooms to choose from. Multi fuel (coal and wood) burner. Veranda with picnic table. Access through patio doors in living area. Property is great. All of us, 4 adults and two children all enjoyed our stay. The site is clean and spotless. Our granddaughters loved playing in the woods. Loads of room in the lodge and sat with the log burner on in an evening was delightful. Recommend it highly. Many thanks for taking the time to review Poppy Lodge. I am so pleased that you all had an enjoyable stay. My daughters love playing in the woods too. I'm pleased that you enjoyed relaxing by the log burner. Best wishes and Happy New Year.